London Bridge/Borough Market Incident: What’s Going On? Though too early to know, the timing raises suspicions – 12 days after the Manchester blast, four days before UK snap elections. Polls suggest a possible hung parliament, Tories losing their majority, a dreaded outcome for Prime Minister Theresa May if occurs, weakening her authority, her party leadership potentially challenged, her political future at stake. Here’s what happened Saturday night in London. 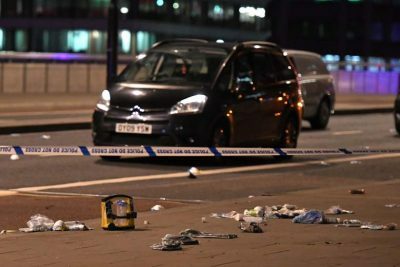 Three alleged assailants drove a van at high speed into pedestrians on London Bridge. It’s unclear how many were struck. Police said stabbings then occurred in nearby Borough Market. Seven deaths were reported, another 30 injured, requiring hospitalization – plus three alleged assailants killed. According to assistant police commissioner Mark Rowley, the incident is being treated as a terrorist attack. Lethally shooting alleged attackers assures dead men tell no tales, leaving important questions unanswered. Was the incident a terrorist attack or something else? The timing is suspicious. Under English common law, individuals accused of criminal or civil offenses are presumed innocent unless proved guilty in a court of law beyond a reasonable doubt. This principle is binding on all Council of Europe countries, including all EU member states, Britain one of them. 2. Respect for the rights of the defense of anyone who has been charged shall be guaranteed. Lethally shooting suspects deprives them of their fundamental rights under EU and UK law. Reports on what happened differ, some indicating three assailants, others saying two, armed with knives. How could so much harm to so many happen without anyone intervening defensively before police arrived? Why didn’t police react more quickly in a heavily patrolled part of London, containing the incident before it got out-of-hand? If assailants wanted to cause mass casualties, why did they use knives as reported, why not easily obtained guns? Knife attacks are the equivalent of hand-to-hand combat, targeted individuals able to do something defensively, maybe able to disarm assailants even when injured. Why would they attack pedestrians in congested areas where bystanders, acting in self-defense, could possibly disarm and hold them until police arrived? Lots of questions remain unanswered. The second violent incident ahead of UK snap elections raises suspicions about what’s going on.